1. I make too many copies. 2. When using even the best machines, including those newly serviced and primed, a double-sided job is a risk. I say prayers while the sheets are sucked through the feeder. Hail Mary, full of grace (the sheets disappear), the Lord is with thee (the originals reappear on the other side of the feeder, safe), blessed art thou among women (the copies begin to move through the machine’s hidden innards), and blessed is the fruit of thy womb, Jesus (the stapler engages), holy Mary, mother of God, pray for us sinners now (the first packet exits, secure), and at the hour of our death (more packets follow, until the first tray is out of paper, and the machine shifts, slowly, to the second tray), Amen. 3. I am a high school English teacher. I give my students books, but they can’t mark-up those bound pages. Yellow and pink Post-its flap from the sides, but after they finish an essay on Beloved, the notes are torn out, stacked, and tossed. 4. Except for that one student who arranged her notes for The Sun Also Rises so that her marks formed Ernest Hemingway’s face. 5. Which is a copy, itself. 7. I have one prep period a day, which means 40 minutes to pause, drink water, but mostly make copies. I hog the machine. I teach AP literature and two levels of creative writing. 8. There are a lot of words worth sharing. Photocopies are my contribution to this literary communion. 9. We used to enter a personal code so that the district could track our copies. Teachers would leech off those who did not log-out. I will neither admit nor deny my own participation. 10. I pull a chair to the front of my classroom. Students open the door, and each day there are fresh copies piled, waiting to be plucked. They are an announcement: it is time for work. 11. “Do you have an extra copy of __________? I lost mine.” Yes. But I always keep two copies for my files. Siblings to be saved. 12. I tell my AP literature students that I might be the last English teacher they will ever have. If they score well on the exam, they will gain college credit and never again read about the “inscrutable house” of Elizabeth Bishop. 13. Which means I am not going down without a fight. 14. Or, without making copies. 15. One of my first summer jobs was destroying photocopies of courthouse records that had become computerized. I fed the sheets into an industrial shredder that chomped staples and clips as easily as paper. 16. Teachers often ask if they can put-in the next job, creating a chain of words that wheel through the overworked machine. It can handle that play in the morning, when tired students trudge to first period and tired teachers down coffee and tired bus drivers chat in the lobby. But come noon, that litany of literature slogs the machine, and it clunks to a stop. 18. The status screen lights up, red scattered among the machine’s skeleton. Someone takes a knee, opens the door, and performs mechanical surgery. 19. Recent copies: “Is it O.K. to Be a Luddite?” by Thomas Pynchon (essay). “Antarctica” by James Hoch (poem). “The Visit” by Amanda Davis (story). “No One’s a Mystery” (pdf) by Elizabeth Tallent (story). “The Way It Has to Be” by Breece Pancake (story). “Stained Glass” by Charles Baxter (story). “Whaling out West” by Charles D’Ambrosio (essay). “Jacob and His Friends Work Out the Difference Between Post and Modern” by Jacob Paul (essay). “The Dinner” by Clarice Lispector (story). “Fiat Lux” by Traci Brimhall (poem). “Cameo” by Natasha Trethewey (poem). 20. Teachers from other departments drift to our building, their eyes wide, originals leaning from their hands. They want to use our machine. They want to know if we have staples. 21. Students expect packets to be stapled. 22. Students shouldn’t expect anything. They are cared for in high school, but that care will end, soon. I ease them off the care, because if I didn’t, I wouldn’t be very caring. 23. My desks are in rows. 5 copies of 5. Like formal verse, I find that the greatest freedom and eccentricity occurs within structure. 24. Other than creative works culled from books or PDFs, my handouts are homegrown, peppered with metafictive asides and references. Those phrases are buried within contextual information about William Faulkner’s Mississippi or sample annotations for “Out, Out” by Robert Frost. A smirk means they found it. A blank stare means they didn’t read, or they found it and are not amused. 25. Whether I mean to or not, my students copy my style of reading. 26. How could they not? They share the room with me for 180 days, 40 minutes a day. 27. But they are never the same as me. Each copy has a smudge, a misplaced staple, a loss of toner, the gain of individuality. 28. Copies for the next week are piled along a cabinet or tucked into plastic shelves. 29. Teaching is all about planning, along with the awareness that plans should often defer to realities. If I meant to talk about how Hemingway hid the subject of the conversation in “Hills Like White Elephants,” but if my students are speaking with passion and insight about the rhythm of the couple’s speech, do I stop them? 30. Photocopying is often a subversive act. I do not mean the breaking of copyright. Fair use is fair. 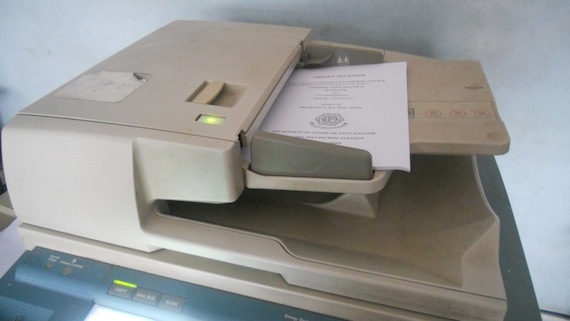 I mean that before quick clicks from smartphone cameras, photocopies were ways of lifting pages from reference libraries and locked offices and spreading them into the outside world. 31. So every photocopy is a manipulation, a copy of a copy. 34. Literature dies when it becomes the means toward the ends of absent politicians and distant state departments of educations. The role of the high school English teacher is also not to create a legion of English majors — God help us — but rather to pause a student’s hectic and harried day and get them thinking about words. 35. Their own words, and the words of others. 36. To get them thinking about auras. 37. Because one argument for literature that should find supporters in both conservative and progressive traditions is that the arrangement of beautiful words into beautiful shapes has intrinsic worth, and that artistic beauty can do something to the soul. 38. Something that might not be catalogued on a rubric, or on a standardized exam. 39. Both of which, ultimately, exit a copy machine and enter less-than-willing hands. “A lot of waxy paper.” from Players by Don DeLillo. 41. I have likely copied more words by or about DeLillo than any other single writer. 42. “If anyone is guilty of turning modern Americans into Xerox copies, it is Don DeLillo.” — Bruce Bawer. 43. I disagree with Bawer, but some of my students might agree with him. What I love about photocopies is that they flatten the spines of books; they wrestle authority from the author for a moment, and give the students a chance to participate. 44. I want them to push back against Bawer and DeLillo. At first, they are knocked down; they swing wildly, without reason. But the firmer their critical sense is cultivated, the sooner they become readers who can mark-up their photocopies with annotations that are not merely “personification” but “Gary Harkness needs Taft Robinson, but Robinson does not need Gary; this scene in the dorm room reveals it.” They become readers who commune with literature. 45. I have saved photocopies from college. Handouts that somehow retain the blue-purple tinge of a typewriter. 47. “Identical twins are not exactly alike. They begin in the womb, at conception, with a single egg and sperm. Twins are made after the egg is fertilized and splits. Similarity is a result of how long the egg takes to divide. The longer it takes for the egg to split, the more alike a set of twins will look. We must have split early. My feet and nose were larger than Cara’s. As adults she usually outweighed me by fifteen pounds. Identical twins share the same DNA but do not have identical DNA. The egg splits into two halves to form identical twins, but the DNA does not divide equally between the two cells. We were like an apple sliced in half: two halves of the same fruit, one with more seeds, one with fewer.” from Her by Christa Parravani. 48. I read Christa’s memoir while in manuscript, and wrote notes after notes on those workshop copies. I hoped that those copies became a book, and they did. 49. My wife and I are always asked how we tell our twin daughters apart. There is a tension in that question that perhaps only an English teacher would worry about: why do we often begin with a desire to separate? My girls are not copies, but they are connected. I see how they look at each other. They share something. 50. I hold the fresh photocopies against my shirt, and they are warm like my daughters’ pajamas from the dryer. Each copy is made with the hope that words will reach hands and eyes that will consider them, if only for the long moments of class. That is enough. This is wonderful and poetic. I read it all through on a busy morning that called for skimming. I am sending it to my favorite English major for herself and her favorite English teacher. I want to stop work right this minute and check out all the photocopied works. Is it really a list? Discuss. Who knew a piece on photocopying could be so engaging? Well done! I loved this. This is so poetic, a beautiful way to look at copies! You, my dear, are sharing literature with the masses, doing your part. I love this.